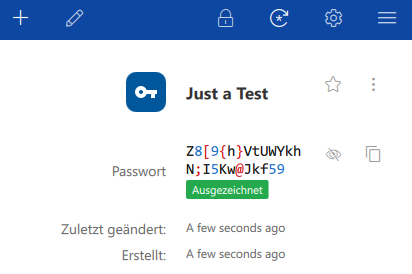 it would be useful when you display the different characters in the password colored, so normal text characters (a to z) have a different color then numbers. Special characters should have a 3rd color. This way I can easily see if a character is a number or a character. Only if you are in the password generation dialog it isn't colorized. 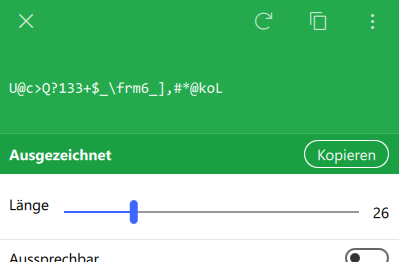 I think that is because the generated password is display on a green background and mixing this with other colors could under some circumstances lead to hard to read passwords. oops, you are right, the password is shown colored. I was in edit mode and there the password was not colored, so I posted this topic. 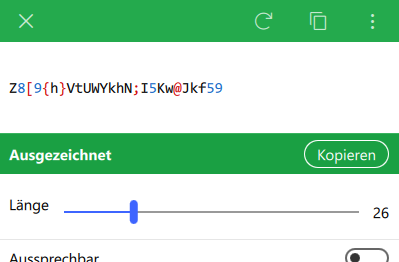 Danke großer Meister, ich war im Edit-Modus und hier ist das Passwort nicht farbig.